Mijas Costa is a large stretch of beautiful coastline located on the Costa del Sol. The centre point of this area is the town of La Cala de Mijas, but it also includes El Chaparral, La Lagunas and Calahonda to name just a few. With such a large area, and so much variety in terms of things to do and sites to see, Mijas Costa is a fantastic place to consider when buying a home in Spain. We’ve listed just a few of the best things to do and places to visit below. The town of La Cala de Mijas, like many along the Spanish coast, began life as a small fishing village. Although it’s population has exploded over the years, there are still aspects of the town that retain that old Andalusian charm, such as El Barratillo street market, which sells everything from local street food delicacies to household ornaments, and everything in between. The town also has a stunning golden beach – Playa La Cala de Mijas. A promenade running along the length of the beach has an array of bars and restaurants. The beach itself is about 2km long and very wide, ensuring there’s plenty of room for you and the whole family. Several local festivals are also held throughout the year, so you can truly immerse yourself in the town’s culture… and of course the wine and dancing. Further along the Mijas Costa from La Cala de Mijas is El Chaparral. Built around a golf course of the same name (El Chaparral Golf), this small, quiet area is mainly residential, but is worth a visit to see the palm tree lined streets with their lovely villas and gardens (you may just leave thinking it would be nice to own your own!). It is a welcome respite for anyone seeking a quiet spot to relax and unwind in a scenic setting. The centrepiece is of course the golf course and club, and enthusiasts will not be disappointed. Although not the largest course in the area, it is one of the best maintained year-round, and has reasonable pricing for non-members. A full 18-hole course awaits with all the amenities you’d expect. It even has a restaurant overlooking part of the course, where you can enjoy a bite with the scenic views. If you want something a bit different from the beach, why not visit the Aquamijas water park on the edge of the Mijas Costa bordering Fuengirola? This park is great for families, with plenty for both kids and adults to enjoy. There is free parking, several restaurants throughout the park as well as plenty of hammock and lounger space if you just want to chill out whilst the rest of the family enjoys the pools and slides. A few miles drive inland from Mijas Costa you will find the beautiful Mijas Pueblo village. 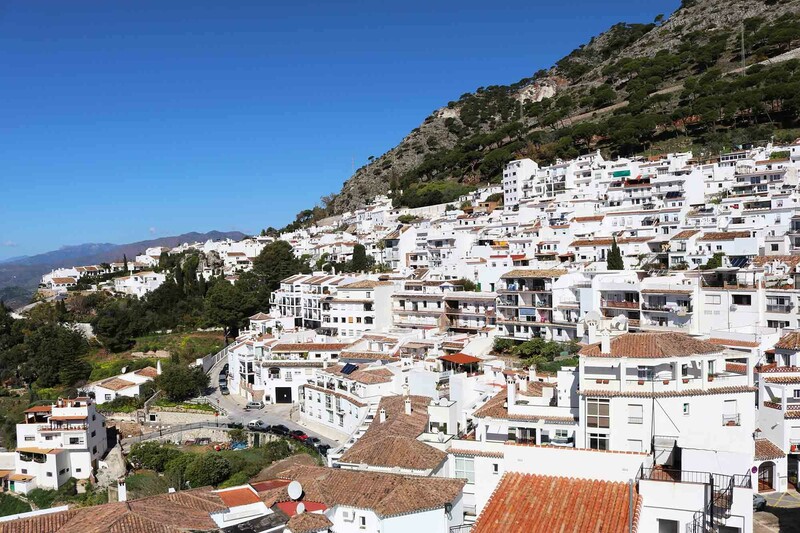 A traditional Spanish white-washed village, Mijas Pueblo offers some of the best views on the Costa del Sol, sitting on a mountainside and overlooking miles of the coastal area. The village has a range of local outlets and boutiques for you to browse, as well as numerous bars and restaurants. Local sites include a variety of churches, from old stone buildings to the more traditional white painted. A small local history museum is also a good visit, if just for its charming exterior of potted plants and traditional architecture alone. It details life in the village and the Mediterranean area through old photos descriptions and exhibits. The town also contains the remains of a historical fortress, since converted into flower gardens; a must-see. Here you can enjoy the finest views from the town overlooking the Costa del Sol and the Mediterranean. Translated roughly as the Malaga Coastal Path, this is a consolidated effort to create a 180km coastal walk, taking in a huge area of the most stunning parts of the Costa del Sol. Supported by many local municipalities, the route runs along the coast from Nerja to Manilva. Although still under construction in some parts, a 6km section in Mijas Costa is complete. A wooden boardwalk taking in sandy beaches and coastal towns, it is well worth an extended evening walk. And if you’re feeling adventurous, why not go further along to the next towns! These are just a few of our favourite things to do in Mijas Costa, but there’s so much more to see. If you’re interested in calling it home, then get in touch with us to discuss your requirements and our available properties. We can even arrange a viewing trip for you to sample the local area and see some shortlisted properties.